We are holding our Christmas Fundraiser this Saturday and we’d love to see you there! With music from all genres, there is something for everyone! 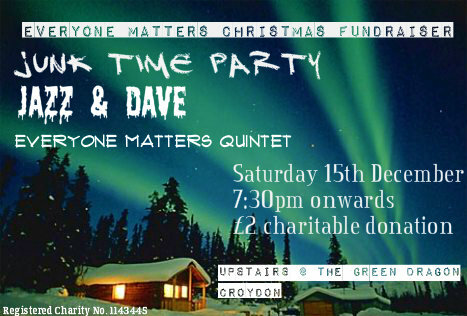 Celebrations kick off at 7:30pm on Saturday 15th December at the wonderful Green Dragon Pub in Croydon (http://goo.gl/maps/12SQI) . Entrance is a donation of £2.00, and you will be getting a lot of BANG for your BUCK.